Last week, the American Board of Internal Medicine Foundation's Choosing Wisely Initiative announced the release of a second round of lists of 5 things that physicians and patients should question, based on evidence that certain tests or procedures are not beneficial in specific clinical situations. AFP will soon be updating our list of primary care-relevant items from the Choosing Wisely campaign, and our Facebook and Twitter accounts will highlight old and new entries daily over the next few months. This AAFP News Now article provides more information about the American Academy of Family Physicians' most recent items, which include elective labor inductions and unnecessary cervical cancer screenings. In the February 15th issue of AFP, Dr. Maria Tirona reviews areas of agreement and disagreement in major organizational guidelines on screening for breast cancer. There is widespread consensus that annual or biennial mammography should be offered to women 50 to 74 years of age, and that teaching breast self-examination does not improve health outcomes. For women 40 to 49 years of age, in whom the risks and benefits of mammography are closely balanced on a population level, the U.S. Preventive Services Task Force and the American Academy of Family Physicians recommend shared decision making, taking into account individual patient risk and patients' values regarding benefits and harms of screening. More and more, the goal for breast cancer screening is not to maximize the number of women who have mammography, but to help women make informed decisions about screening, even if that means that some women decide not to be screened. ... The goal of improving patient decision making should be expanded to all women eligible for breast cancer screening (i.e., those 40 to 75 years of age who are in reasonable health), because the benefits and harms of screening are not very different among these age groups. The primary benefit of screening mammography is an estimated 15 percent relative reduction in deaths from breast cancer; harms of mammography include false positive results, overdiagnosis, and overtreatment. A recent study published in BMJ explored the impact of overdiagnosis on attitudes toward mammography in several focus groups of Australian women 40 to 79 years of age. Few women had ever been informed about overdiagnosis as a potential harm of screening. Most women continued to feel that mammography was worthwhile if overdiagnosis was relatively uncommon (30 percent or less of all breast cancers detected). However, a higher estimate of overdiagnosis (50 percent) "made some women perceive a need for more careful personal decision making about screening." This means that for every 2,000 women invited for screening over 10 years, one will have her life prolonged, and 10 healthy women who would not have been diagnosed if there had not been screening will be treated unnecessarily. Furthermore, more than 200 women will experience important psychological distress for many months because of false-positive findings. Given this information, what approach do you take to screening mammography? Do you believe that this test should be routine for women of eligible ages, a shared decision for some, or (as Drs. Harris and Kinsinger advocate), a shared decision for all? Why is it often difficult to promote shared decision making in clinical practice? 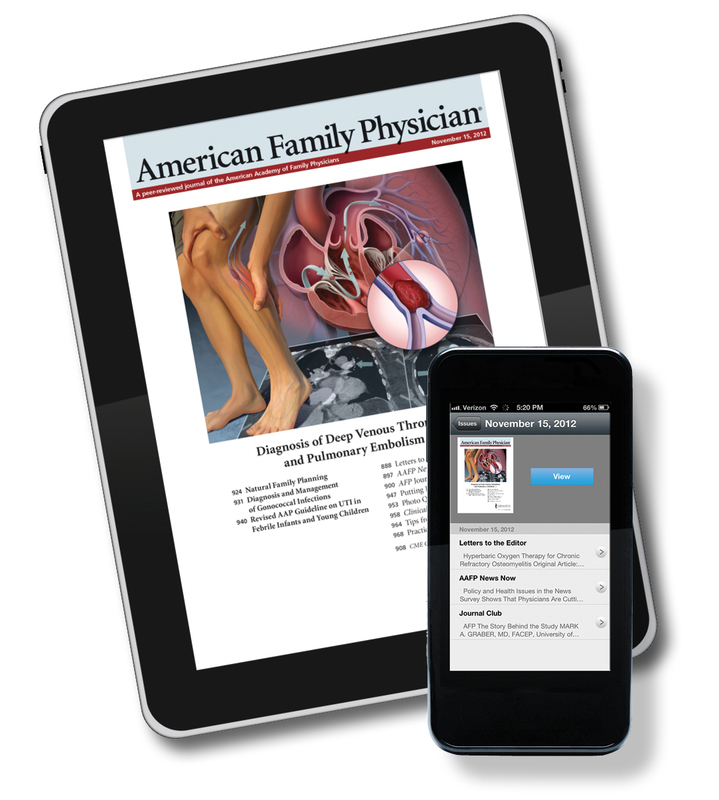 Now you can keep up with American Family Physician in a format that's as mobile as you are. AFP is pleased to announce the new mobile app edition of the journal. This app provides a digitally enhanced replica of AFP for tablets and smartphones. Other features include downloading for offline reading; quick links to full articles; bookmarking content; sharing articles with colleagues; and real-time news and content feeds from the American Academy of Family Physicians (AAFP) and the AFP Community Blog. The apps are free for AAFP members, print and online paid subscribers, and individuals who currently receive the journals in their own name; all others can purchase individual issues within the app. The app is now available in the Apple App Store and will be coming soon to Google Play. Search the App Store for “AAFP” or “American Family Physician” to download the app, and then sign in using the e-mail address associated with your AAFP account to start downloading issues. Are calcium supplements bad for the heart? Until recently, the idea that calcium-containing supplements, which more than half of older adults in the U.S. consume regularly, could be harmful would have seemed absurd. Primary care clinicians have long recommended calcium supplements to reduce the risk of osteoporotic fractures in adults who are unable to meet the Institute of Medicine's Dietary Reference Intakes through diet alone. However, a large prospective study published this week in JAMA Internal Medicine demonstrated a statistically significant association between supplemental calcium (as opposed to dietary calcium) intake and a 20 percent higher relative risk of death from cardiovascular disease in men. In both of our meta-analyses, calcium supplementation was more likely to cause vascular events than to prevent fractures. Therefore, the bolus administration of this micronutrient should be abandoned in most circumstances, and patients should be encouraged to obtain their calcium intake from an appropriately balanced diet. For those at high risk of fracture, effective interventions with a fully documented safety profile superior to that of calcium are available. We should return to seeing calcium as an important component of a balanced diet and not as a low-cost panacea to postmenopausal bone loss. In the second editorial, Dr. Rajib Bhattacharya points out that the Women's Health Initiative and other randomized trials did not indicate that calcium supplements increased cardiovascular risk. He argues that secondary analyses of trials designed with other primary outcomes in mind may have predisposed these analyses to unforeseen bias, and that there is "no compelling evidence" that calcium supplements at usual doses pose dangers to heart health. Notably, a draft recommendation statement released by the U.S. Preventive Services Task Force last June stated that there was insufficient evidence that vitamin D and calcium supplementation prevent fractures or cancer in otherwise healthy older adults. Although the only adverse effects of supplements mentioned in the Task Force's evidence review were renal and urinary tract stones, none of the reviewed studies were specifically designed to assess cardiovascular harms. Is it time to abandon routine calcium supplementation in healthy adults? If not, what additional evidence might make you change your practice?